Hundreds of writers put their stories on the line for New Times' 29th annual 55 Fiction contest. Like the surf that pounds the sand, judges—Proofreader Andrea Rooks, New Times Staff Writer Chris McGuinness, and Sun Staff Writer Brenna Swanston—carefully mulled over each story in the stack, picking only those tales with the smoothest surfaces to deposit on the pages of this year’s issue. Snuggling up alongside those little novels are six works of art, created with the intention of giving image to a 55-word story of each artist’s choosing. 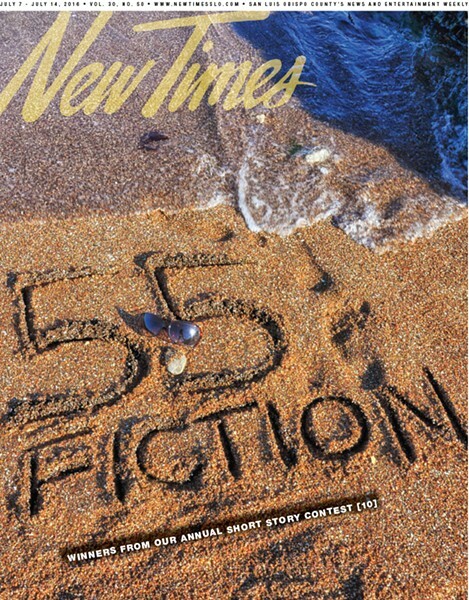 Support student journalists with 55 Fiction! New Times established the Stephen Donnellan Moss Memorial Scholarship in Journalism Fund to honor our founder by providing scholarships to deserving student journalists enrolled in Cal Poly’s journalism program. This year, student Megan Schellong received the $1,500 award. Applications are available to Cal Poly journalism majors during the winter term, and the scholarship fund is held with The Community Foundation San Luis Obispo County. Make a contribution to the fund by finding 55 Fiction volumes at the Amazon Kindle ebook store at amazon.com/dp/B01I0RQ5M6#navbar. Proceeds from ebook sales go to support the scholarship fund. To find out more about the scholarship, visit cfsloco.org.